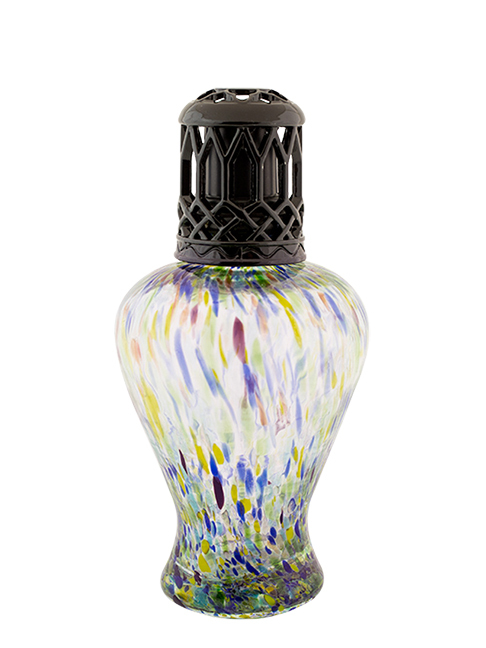 Gift Ideas for Cigar and Pipe Smokers! 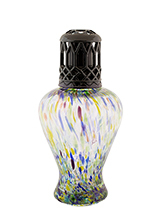 ~ Cigar Gift Sets, Gift Ideas, Gift Certificates for Cigar and Pipe Smokers. Whether it's a Birthday, Anniversary, Valentine's Day, Father's Day, Mother's Day, the Holidays - We Have the Perfect Gift! Home » Gift Ideas for Cigar and Pipe Smokers! Gift Ideas for Cigar and Pipe Smokers! 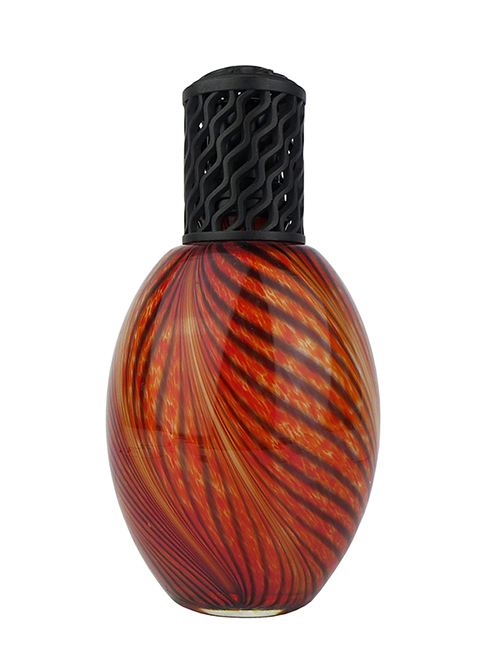 Looking for a gift for that special cigar or pipe smoker in your life? 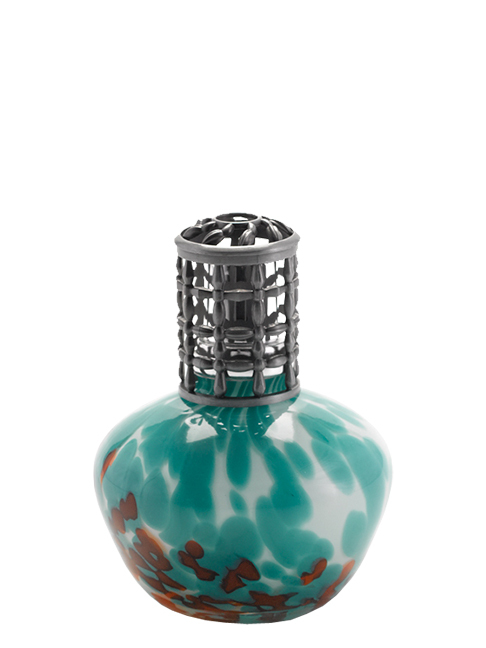 Whatever the occasion - a birthday, anniversary, Valentine's Day, Father's Day, Mother's Day, the holidays - you're sure to find the perfect gift at Milan Tobacconists. In addition to the cigar gift sets, pipe tobacco sampler, and effusion lamps listed on this page, we have hundreds of other great cigar- and pipe-smoking related products throughout the site from which to choose. For the cigar smoker, we think a cigar sampler is a gift that can't miss. It's the perfect opportunity to introduce your friend, relative, or associate to a variety of new cigars. Visit our Cigars page, click on any of our premium cigar brand links, and choose from any number of single cigars to make your own cigar sampler. We'll include a free Boveda 2-way humidity control packet to keep them in peak condition during shipping and beyond! 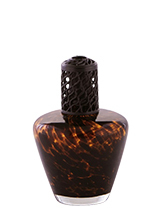 Of course, cigar gift sets like the ones listed below are also very popular with cigar smokers. 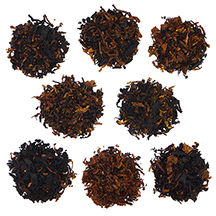 The Milan Pipe Tobacco Sampler below is perfect for pipe smokers. The sampler includes 8 one-ounce packages of our most popular high grade aromatic, non-aromatic, and English pipe tobacco blends. It's like a box of chocolates for pipe smokers - they're sure to discover one or two favorites in the bunch! 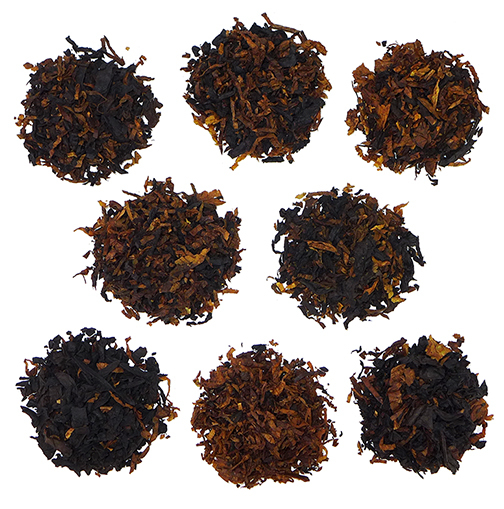 Another option is to put together your own sampler by visiting our Milan Pipe Tobacco page. Any of our quality briar and meerschaum pipes and large assortment of pipe accessories are sure to bring a smile to his or her face too! 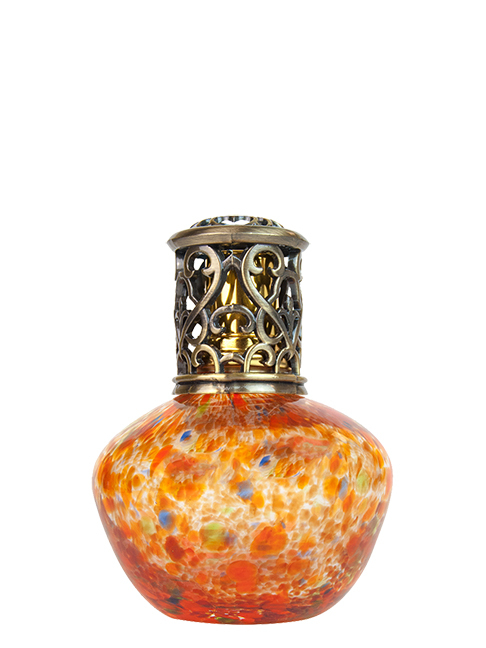 Our beautiful effusion lamps and fragrances offered below are great gifts for both cigar and pipe smokers (and their significant others!). If you're just not sure what to give or you've run out of time, we suggest a Milan Tobacconists gift certificate emailed directly to his/her inbox. Gift certificates are available in $25 increments up to $1,000 - from the economical to the extravagant, it's entirely up to you! 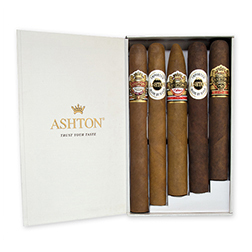 Ashton cigars are celebrated the world over for quality, consistency, and excellence. This exceptional 5-cigar assortment offers cigar enthusiasts a selection of Ashton's best-selling cigars in different formats: Aged Maduro #40, Cabinet Selection Pyramid, Classic 8-9-8, Heritage Puro Sol Churchill, and VSG Virgin Sun Grown Robusto. The result is a perfect balance of complexity and character in one spectacular cigar sampler. 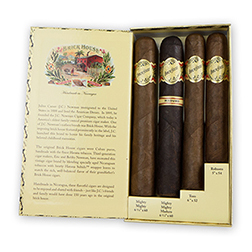 The Mighty Mighty and Mighty Mighty Maduro with their 60 ring gauge size visually dominate this Brick House 4-cigar sampler from J.C. Newman Cigar Company, but the accompanying Toro (6" x 52) and Robusto (5" x 54) cigars hold their own in the flavor department. Blended with specially aged Nicaraguan tobaccos wrapped in hearty Havana Subido leaves, these beautifully handmade, flavorful cigars start out earthy and crisp, yet have a distinctive flavor. 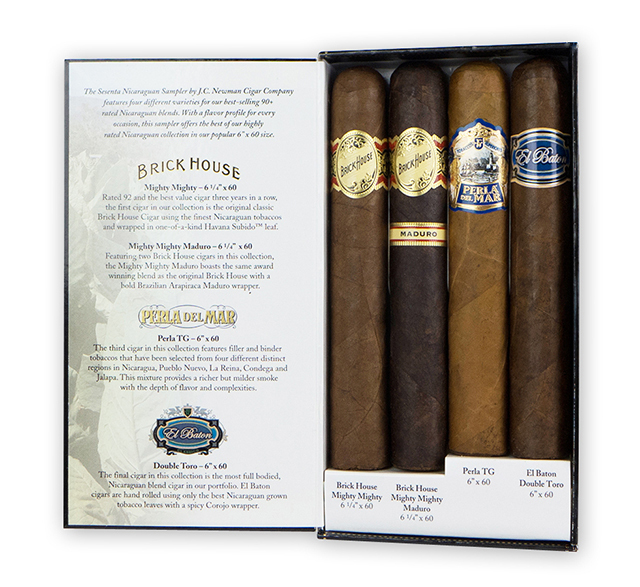 The award-winning Brick House line has been a tremendous hit with cigar aficionados, and this sampler makes the perfect gift for the Brick House cigar fan or serves as a great introduction to the line. 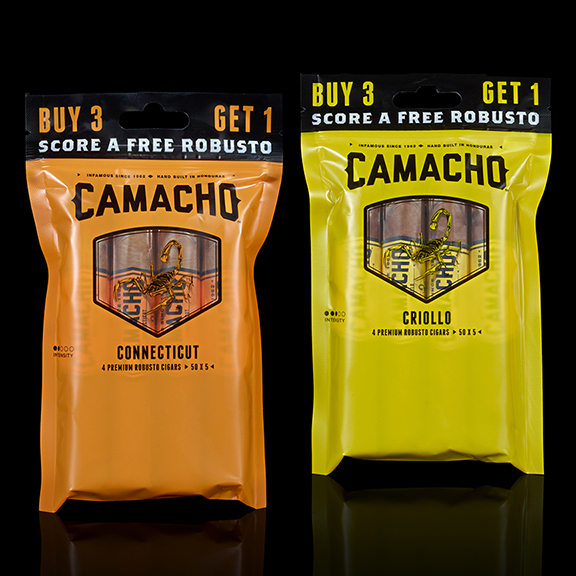 The Camacho Connecticut offers a milder smoke with rich flavor and a spicy kick that won't knock you off your feet. 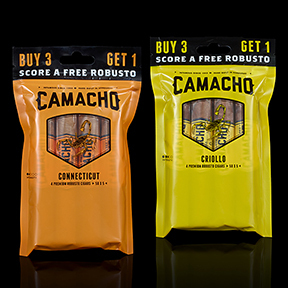 Experience Camacho's take on "boldness meets balance" with this terrific Buy 3/Get 1 FREE Robusto cigar sampler. These premium cigars are presented in a humidification bag to keep them in optimal smoking condition for months. The Camacho Criollo is a spin on the taste profile of modern-day Cuban cigars. While the Criollo is dialed back a degree in intensity, it is packed with unique, peppery flavor and delivers a powerful burst of signature Camacho taste. Enjoy these complex, mid-intensity cigars and save with this great Buy 3/Get 1 FREE Robusto cigar sampler. These premium cigars are presented in a humidification bag to keep them in optimal smoking condition for months. 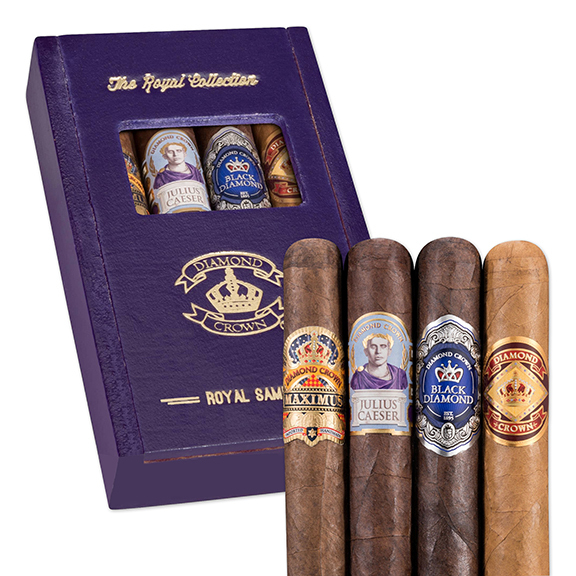 Give yourself or the cigar aficionado on your gift list the royal treatment with Diamond Crown's new Royal Sampler. This spectacular sampler contains Diamond Crown's finest super premium cigars blended by the legendary Carlito Fuente for J.C. Newman Cigar Company and beautifully handmade at Tabacalera A. Fuente in the Dominican Republic. The Royal Collection's highly rated cigars include one each medium/full-bodied Diamond Crown Black Diamond Emerald, mild to medium-bodied Diamond Crown Classic Robusto #4, medium-bodied Diamond Crown Julius Caeser Toro, and full-bodied Diamond Crown Maximus #4. Enjoy the full flavor spectrum of Diamond Crown cigars in one very special sampler. 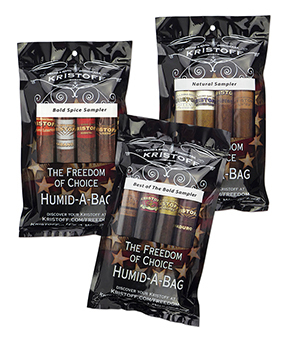 The "Natural Sampler" offers cigar lovers a delicious taste of Kristoff's more mild, smooth, and full-flavored cigars in the Robusto format with one each Brittania Reserva (cream, hazelnut, a hint of spice and sweet butteriness); Connecticut (vanilla, spice, cream and sweet nuttiness); Kristania (spice, vanilla bean, rich espresso and sweetness); and Original Criollo (toasted almond, hints of spice and sweetness). These premium cigars are individually wrapped in cellophane and presented in a humidification bag to maintain optimal smoking condition for months. 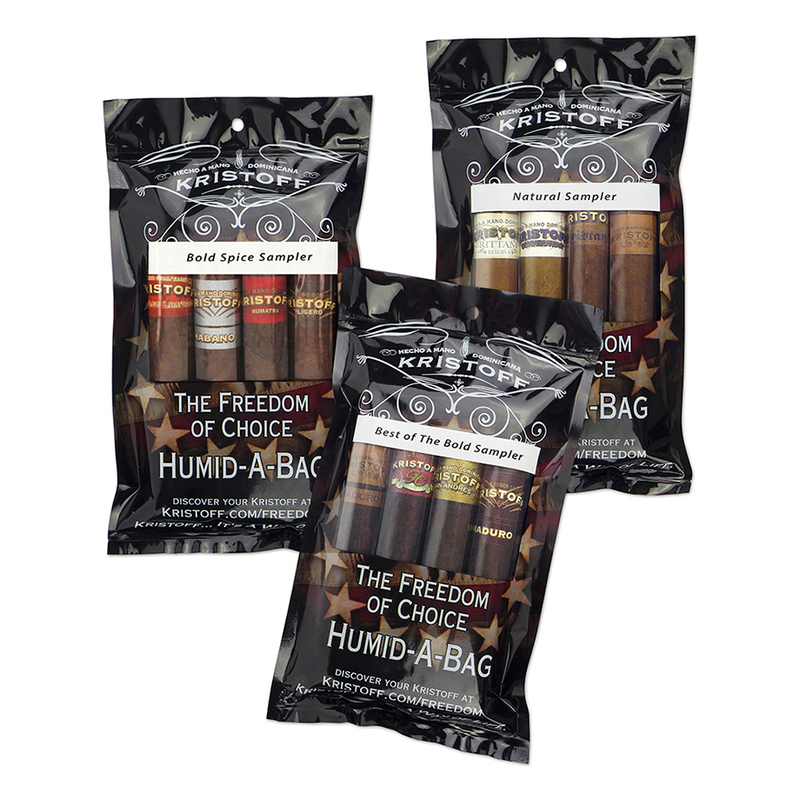 Kristoff's "Bold Spice Sampler" presents a bold and spicy selection of medium- and full-bodied cigars with one each Robusto-sized Corojo Limitada (spice, nutmeg, and toasted nut); Habano (sweet pecan, spice, notes of white pepper and cedar); Ligero (toasted nut, caramel, hints of cedar and spice); and Sumatra (velvety floral notes, spice, and cinnamon). Individually wrapped in cellophane and presented in a humidification bag, these premium cigars will remain properly humidified for months. The "Best of the Bold Sampler" answers the cigar aficionado's demand for a choice sampling of Kristoff's most full-bodied cigars in the Robusto format with one each Criollo Maduro (toasted almond, hints of spice and sweetness); GC Signature Series (espresso and dried apricot); Ligero Maduro (toasted nut, caramel, undertones of cedar, spice, and sweetness); and San Andres (spice, subtle black pepper, milk chocolate and coffee cream). These premium cigars are individually wrapped in cellophane and presented in a humidification bag to keep them in peak smoking condition for months. 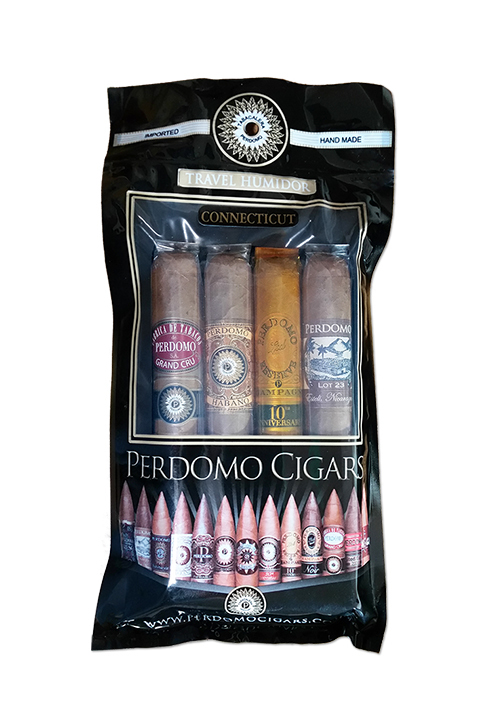 Perdomo Cigars' Connecticut 4-Cigar Sampler represents some of the company's finest Nicaraguan premium cigars in the toro format. This mild to medium-bodied selection includes a Grand Cru 2006 Connecticut cigar blended with exceptional aged tobaccos for a silky smooth taste and aroma; one Perdomo Habano Connecticut cigar with notes of nuttiness, spice, and sweetness; a Perdomo Reserve 10th Anniversary Champagne cigar that offers layers of complex flavors and sweet, creamy flourish; and, finally, the Perdomo Lot 23 Natural, which is comprised of exquisite aged tobaccos and imparts a nutty flavor with hints of cedar and toast. 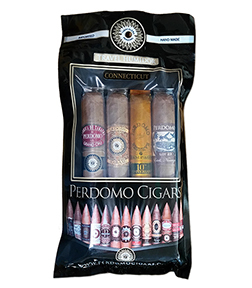 All are individually wrapped in cellophane and presented in a Perdomo Cigars branded humidification bag, which keeps your premium cigars in peak condition no matter where your travels take you. 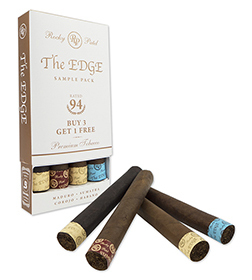 Rocky's The Edge Sample Pack offers cigar lovers four of his highly rated cigars in the Toro (6" x 52) format for the price of three. 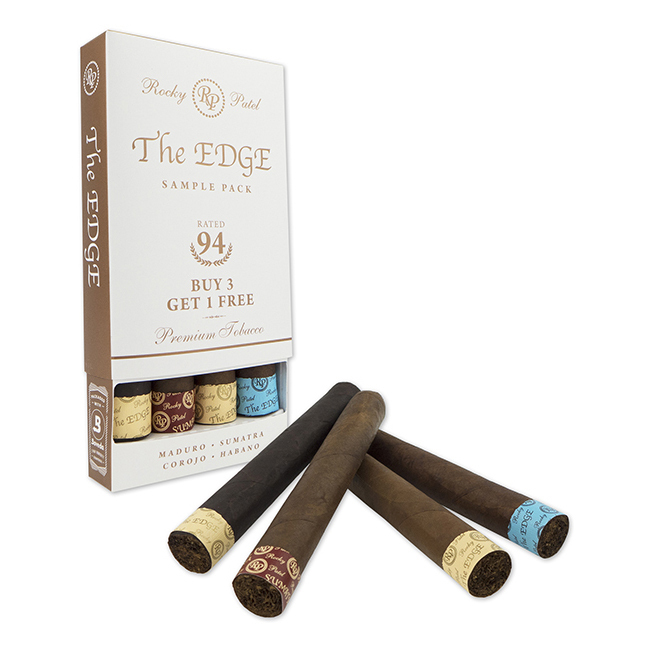 This bold assortment of smooth, full-bodied cigars runs the flavor gamut from spice bombs to rich and sweet: one each The Edge Corojo, The Edge Habano, The Edge Maduro, and The Edge Sumatra. Hold on to your hat and live life on The Edge! 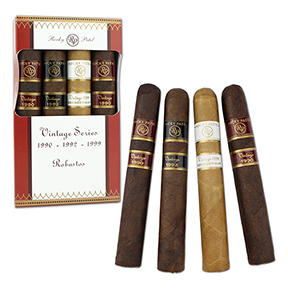 Rocky showcases three of his highly-rated Vintage Series premium cigars in the Robusto (5 1/2" x 50) format with this stellar 4-cigar sampler containing two medium/full-bodied Vintage 1990 cigars with rich flavor and a hint of sweetness; one Vintage 1992 medium/full-bodied cigar delivering coffee, cedar, earthiness and spice; and one Vintage 1999 Connecticut cigar offering a mild/medium-bodied, smooth and creamy smoke. Vintage Series cigars are expertly hand crafted in Honduras with finely aged tobaccos and reflect Rocky's masterful blending skills. The Sesenta Nicaraguan Cigar Sampler features four different varieties from J.C. Newman's bestselling 90+ rated Nicaraguan blends in their 60 ring gauge size. With a flavor profile for every occasion, the Sesenta Nicaraguan Sampler includes the following four cigars: The 6 1/4" x 60 Brick House Mighty Mighty holds a 92 rating and has been awarded the best value cigar three years in a row, while the Brick House Mighty Mighty Maduro boasts the same award-winning blend, but is wrapped in a bold Brazilian Arapiraca Maduro wrapper. The Perla del Mar Perla TG (6" x 60) is a richer, but milder smoke that offers a depth of complexity and flavor. The final cigar in this collection is the El Baton Double Toro (6" x 60), which is the most full-bodied Nicaraguan blend in the company's portfolio, blended with only the best Nicaraguan grown tobacco leaves with a spicy Corojo wrapper. 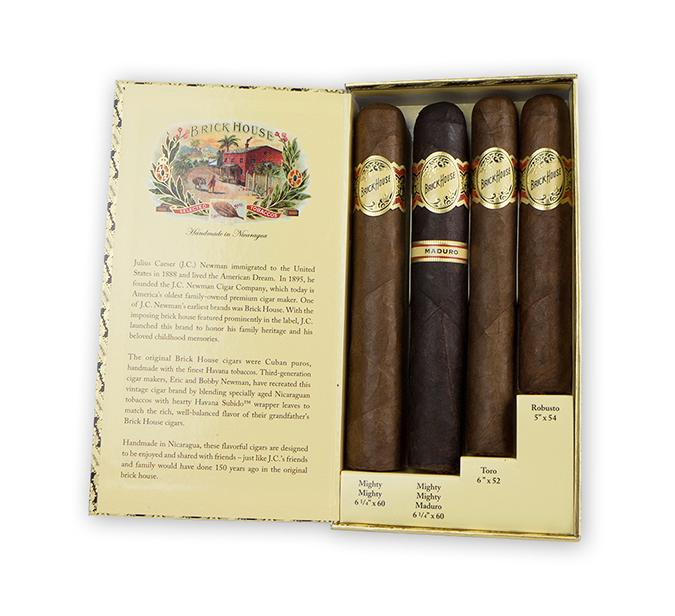 The four handmade cigars are attractively presented in a gift box. The Milan Pipe Tobacco Sampler is the perfect gift for pipe smokers. The sampler includes 8 one-ounce packages of our most popular high grade aromatic (4 blends), non-aromatic (2 blends), and English (2 blends) pipe tobaccos. It's like a box of chocolates for pipe smokers - they're sure to discover one or two favorites in the bunch! An effusion or fragrance lamp exchanges fragrance for unwanted odors in the air. 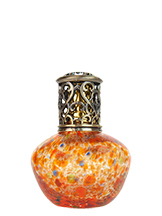 The lamp operates at approximately 1/3 the temperature of a candle, drawing fragrance up through the wick to the burner. The burner releases the fragrance and saturates a room more quickly and consistently than other fragrance products. 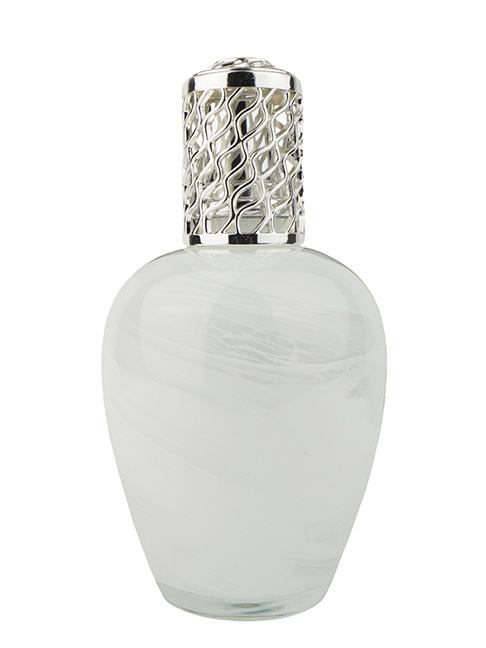 It typically takes about 45 minutes to fragrance the average size home. 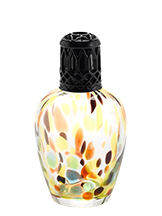 These aromatherapy effusion lamps are beautiful, innovative, and functional; the fragrances are delightful. 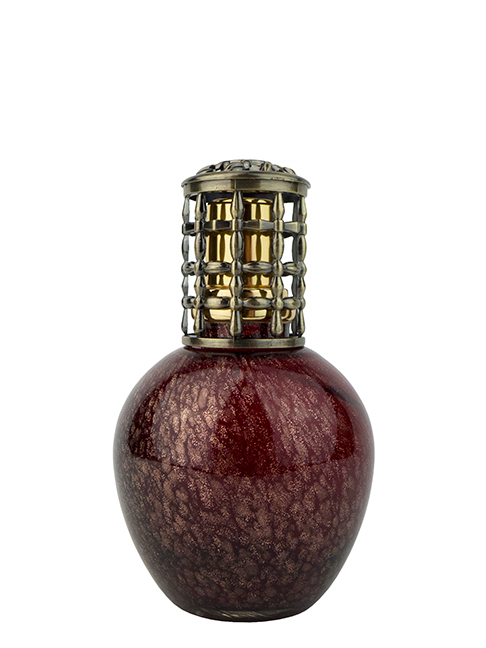 Each lamp comes with a wick and burner stone assembly. 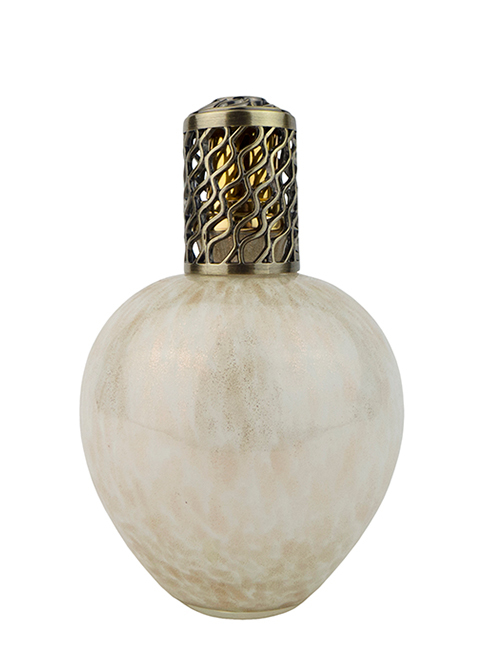 Please note that the lamp measurements provided are approximate and the patterns vary slightly from lamp to lamp. Fragrances sold separately below.